During the dig at Castleshaw fort in July 2014 an unexpected stone paved area was found just outside the east gate and apparently heading north. This is the area shown below in red. 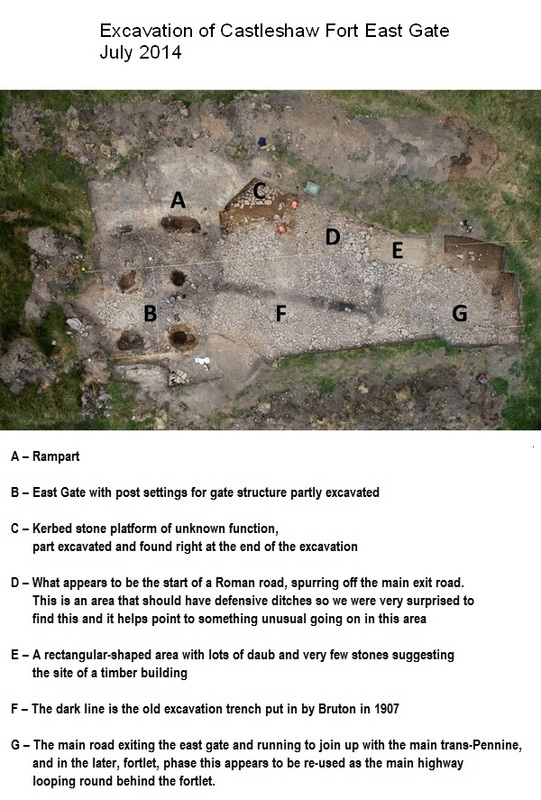 This is an aerial view of the excavation of the East gate from 2014 and shows a number of interesting features as listed. 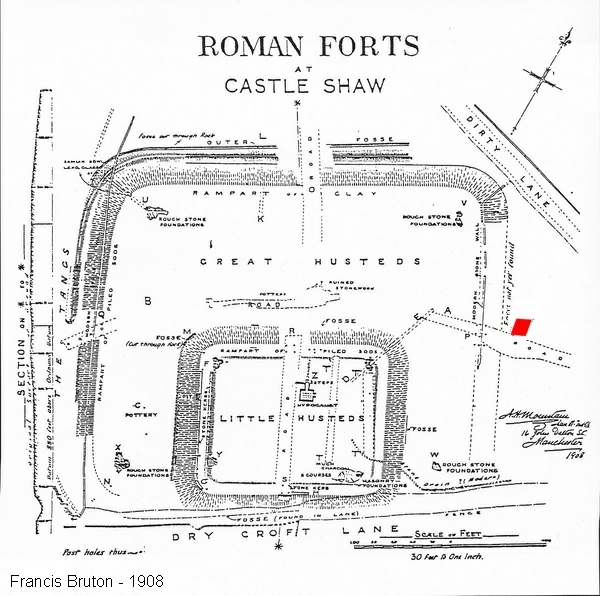 The east gate was excavated originally in 1907 by Francis Bruton as part of the first large scale excavations of the Fort and Fortlet and was the source of the overview map I have used above from his 1908 book on the Forts. His trenches being clearly visible at 'F'. It was the discovery of the apparent start of the road at 'D' which sparked our interest in the possabilities of a new road. On the 24th june 2017, as part of the Greater Manchester Archaeology Festival and in conjunction with test pitting outside the northern defences of the fort we surveyed the area indicated left. The area includes the outer part of the eastern gateway and the area to the north of it. The photo above shows the area to be surveyed. The fort gateway is about 1/3 of the way across from the left on the near horizon (just about where the yellow Resistivity meter is). 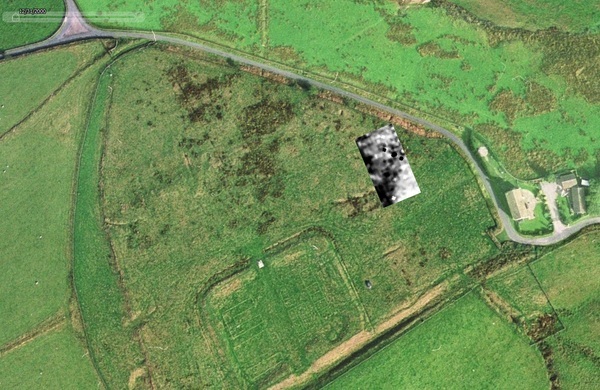 The area to be surveyed contained a number of older trenches. 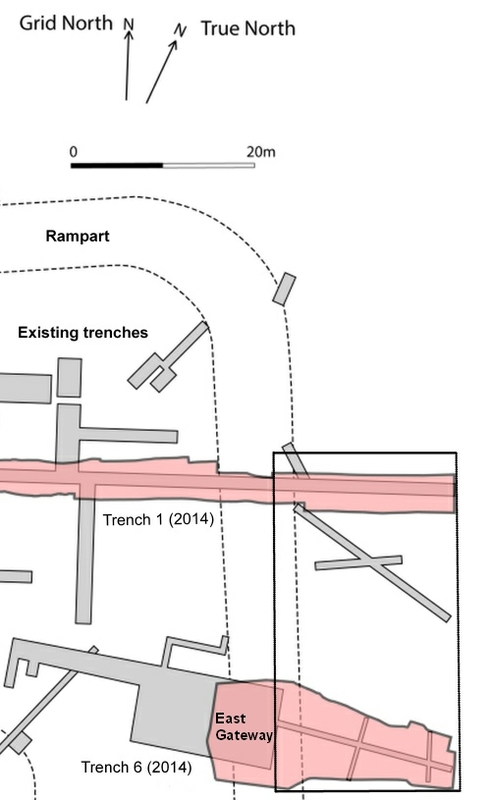 Trench 1 from the 2014 excavation traversed the north of the area while trench 6 from 2014 crossed the southern area. A couple of historical trenches of unknown origin also crossed the area. The resulting resistance survey appears to show a road (darker = high resistance = harder surface) heading directly from the gateway in a northerly direction. The more solid areas of the rampart at the left also appearing darker due to the compact materials. The dark crosses are merely a result of the computer processing and are probabily single stones encountered by the meter. (they should be treated as a single 'high resistance' object). Note that some of the previous known trenches appear as lighter bands due to the less compact infill. There are possibly some other 'anomalies' (unknown trenches maybe) appearing as lighter bands across the area. This is the Resistivity survey results overlaid on an aerial photo and shows the dark (high resistance) band leaving the eastern gateway heading north. The eastern gateway in this image has a covering of rushes due to the slight depression in the land accumulating water. 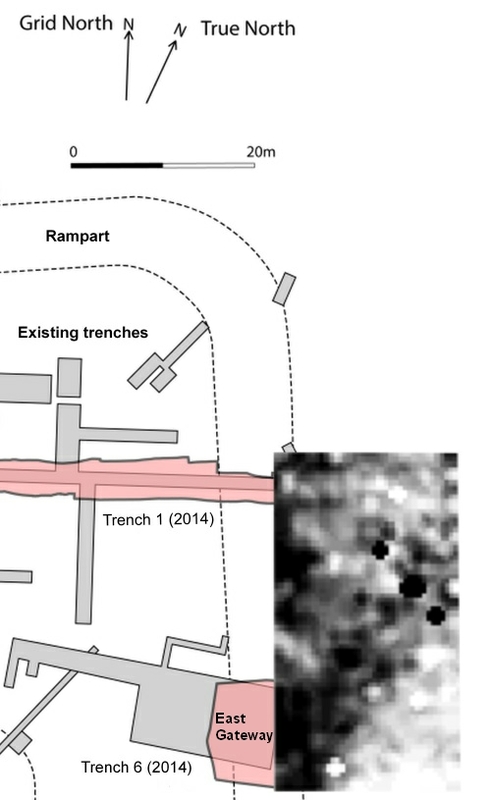 Note: A number of historical trenches across the site can be seen (plus the layout of the fortlet buildings highlighted after previous excavations). 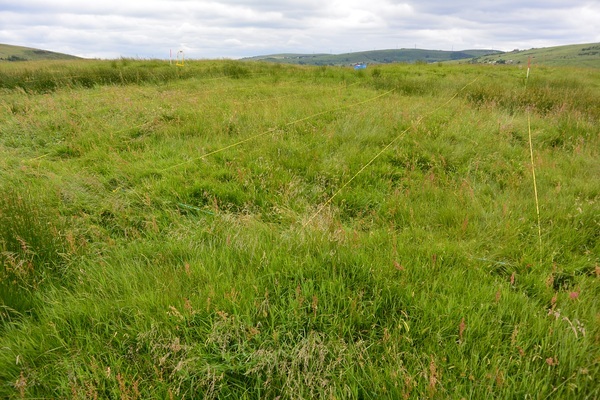 The survey was performed by Phil Barrett and Jane Neild of the Friends of Castleshaw Roman Forts using an R M Frobisher TAR-3 Resistance meter. The grid was a 36m x 20m grid and readings were taken each metre.